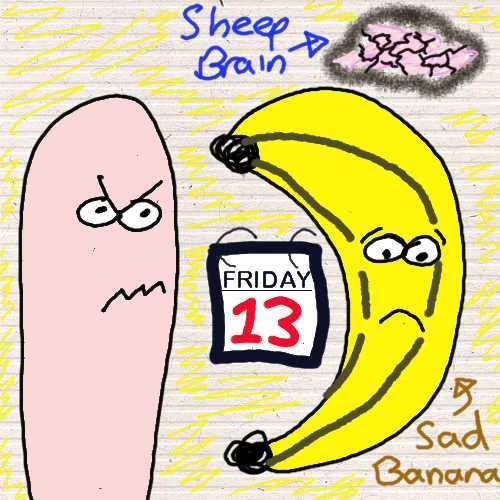 This entry was posted in Uncategorized and tagged bananas, Comedy, friday 13th, Humour, iPhone, Netherlands, Superstition, unlucky day by stroppysausage. Bookmark the permalink. Most people around the world think it’s unlucky to set sail on a boat on Fridays. There are lots of bad things associated with this. One guy tried to say this was stupid, so as well as setting sail on a Friday, he called his ship HMS Friday. They were never seen again. Without bananas the world would end. It will be the cause of the ‘2012’ saga. Another great post and one that I whole heartedly agree with. Becoming a bit of a regular follower at this rate! All followers welcome 😉 Even ones from Nottingham! Love it, how come companies can you about so much, but you try to say to them my payment went to wrong address they would be down on you like a ton of bananas. Exactly! Double standards or what!? Absolutely loved this post from start to finish! Such a funny read & I too am with you on finding it rather irratating that people are somewhat “afraid” of friday 13th. I once went on holiday on friday the 13th and my friends were asking how I could travel on such a day… rather silly tbh.